The franchise player Derek Jeter is sure to disappoint every New York Yankee fan in the world after deciding not to retire after this baseball season. One of their star players for years, Jeter has signed a multi-year deal with Yankees rival the Boston Red Sox. According to sources, Boston has been eyeing the possibility of picking up Jeter since he announced he would retire after this year, his 20th season in the MLB. Reportedly, the deal will make him an additional $25 million a year for the 3 years of his contract. Reports have confirmed that Jeter and his agents have agreed to the terms of the contract, and Jeter is signing on the dotted line Wednesday evening. Rumors swirled across the league that the Red Sox sent Jeter an offer during the all-star break, but insiders say they didn’t believe that Jeter would be interested. After 20 years in baseball, the game has taken its toll on Jeter, and he reportedly was looking forward to giving up the game. Once Jeter’s lawyers got their hands on the contract, they persuaded him to take the deal. Fans of both New York and Boston are vehemently against the signing. 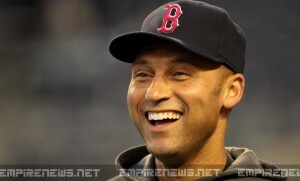 New York fans consider Jeter a traitor for signing with their biggest rival; Boston fans want nothing to do with the ‘face of the Yankees’ playing for their beloved team. So far, Jeter has not commented publicly on his deal. A request for comments from Jeter’s management team was not immediately returned.